Durban - A KwaZulu-Natal woman is calling on all South Africans to unite against King Goodwill Zwelithini’s controversial call to have foreigners deported from South Africa. believed that the Zwelithini’s comments fuelled an already burning issue. "As I took of the taxi in Durban, everyone was saying that non-South Africans must go. This has become a song that is sung in every place. "An old granny said, 'These people must go, our children are unemployed because of them. They come with drugs and [commit a] lot of crime, they are now even killing us with their untreated diseases,'"recalled Mdlalose. Tempers flared in Durban on Wednesday as riot police clashed with foreigners in the city centre. The police reportedly used water cannons, stun grenades and teargas to disperse a group of foreign nationals who gathered to protest against xenophobic attaches in KwaZulu-Natal. Foreign nationals have reportedly been attacked in the province following statements made by the Zulu king who reportedly said, "foreigners must pack their bags and go home". The woman from KwaMashu said Zwelithini’s statement was being used some "to fight their own dirty battles". She disputed that the attacks were started by Zwelithini’s comments, "but on the other hand the king’s statement perpetrated an already burning fire". "Does he know that this statement of 'Foreigners must go' also means that his wife must go? 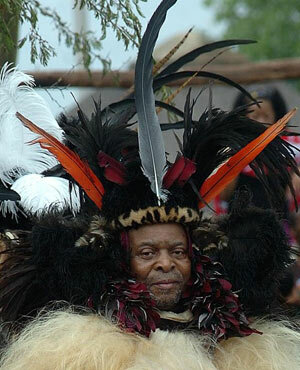 It has been known that King Goodwill Zwelithini’s sixth wife is a Swazi woman," she said referring to Queen Zola Mafu. "Are his statements also directed at her, or is it only directed to those who are not associated with the King?" asked Mdlalose. She said she had lost all respect for the Zulu king. "What kind of leader spills petrol in the fire and sit back as if nothing happened? What kind of a leader is silent when there is bloodshed everyday and accusations of the bloodshed is lingering under his statement? What is so difficult for him to withdraw his statement? in him; I am even ashamed of my own [Zulu] tradition, if traditional leaders can speak such and be proud of it," Mdlalose said. She said President Jacob Zuma’s silence on the matter was a matter of great concern. Princess Sebentile Dlamini, King Mswati III’s half-sister. Zwelithini to withdraw his statement to show good leadership. "My biggest fear is war in this country. [We could go] from violence to riot and to war. Let’s unite and stand against King Goodwill Zwelithini statement," said Mdlalose.